President Trump has a beef with NATO. He's called the alliance "obsolete" and accused other members of not spending their fair share. "We are spending a tremendous amount in NATO and other people proportionately less," he said during the campaign. "No good." When it comes to costs, Trump has a point. 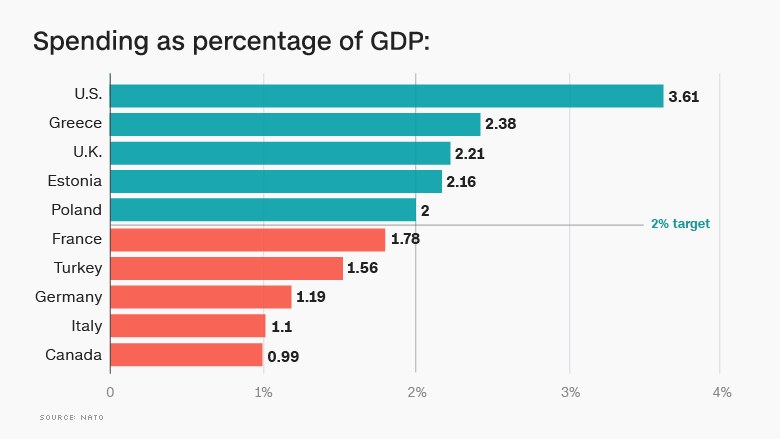 Only five of NATO's 28 members -- the U.S., Greece, Poland, Estonia and the U.K. -- meet the alliance's target of spending at least 2% of GDP on defense. Getting more NATO members to pay their way will be something Trump and U.K. Prime Minister Theresa May can agree on when they meet Friday at the White House. The alliance increased overall defense spending for the first time in two decades in 2015, but the U.S. is still doing a lot of the heavy lifting. It spends the highest proportion of its GDP on defense: 3.61%. The second biggest NATO spender in proportional terms is Greece, at 2.38%, according to NATO. Meanwhile, Germany spent 1.19% last year, while France forked out 1.78%. Canada, Slovenia, Belgium, Spain and Luxembourg all spend less than 1%. 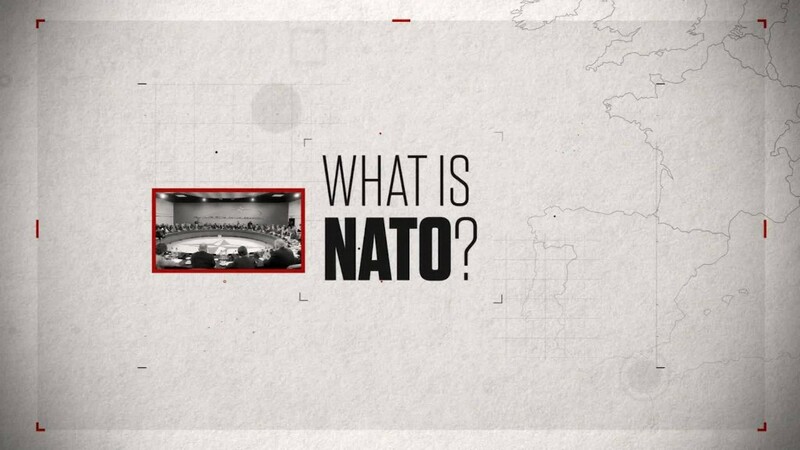 NATO admits it is overly dependent on the U.S. for the provision of essential capabilities, including intelligence, surveillance and reconnaissance, air-to-air refueling, ballistic missile defense and airborne electronic warfare. According to NATO statistics, the U.S. spent an estimated $664 billion on defense in 2016. 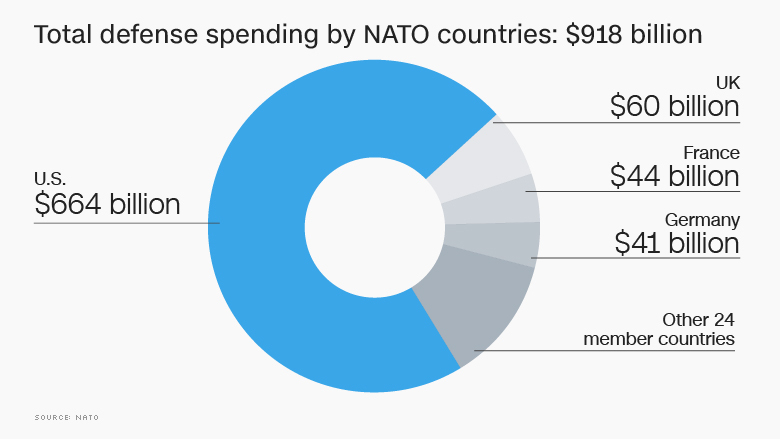 That's more than double the amount all the other 27 NATO countries spent between them, even though their combined GDP tops that of the U.S.
NATO is now pushing hard for the 2% guideline to be taken more seriously. Back in 2014, all member countries that fall below the threshold committed to ramp up military spending to reach the target within a decade. Most countries are sticking with the promise: 12 increased their spending in 2014, and 16 did so in 2015. Last year, 22 countries spent more as a share of their national economic output. Fear of Russian aggression is driving some of the splurge. Latvia, which shares a border with Russia, increased its defense spending by 42% in 2016. Its neighbor Lithuania boosted its outlays by 34%. Both, however, are still below the 2% threshold. A campaign is now underway to convince Trump to look beyond monetary costs. A Polish soldier takes part in NATO exercises. 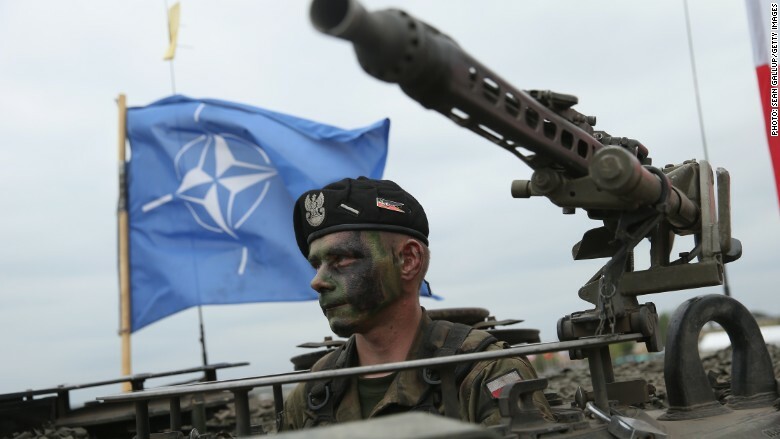 Poland is one of only five members that meets NATO's guideline for defense spending. Retired Marine Gen. James Mattis, Trump's choice for defense secretary, has described NATO as vital to U.S. national interests and security. Former ExxonMobil (XOM) CEO Rex Tillerson, expected to be confirmed as secretary of state, has also defended the alliance. Prime Minister May is expected to stress the vitality of the union when she meets with Trump. "What is important is that we recognize the value of NATO ... as an organization that is helping us defend Europe and the interest of all of those allies that are in Europe," May said Sunday. Trump, however, may still view the matter differently. The real estate developer touched on the theme in his inaugural address, saying the U.S. has for too long "subsidized the armies of other countries while allowing for the very sad depletion of our military."